Did you know satellite Wi-Fi means you can start watching movies as soon as your flight leaves the gate? Or that blue lighting is scientifically proven to have a calming effect? Today we’re pulling back the curtain on our new cabin interior. The latest technology played a central role in the design. We’re actively rolling out high-speed satellite internet, with about half of our mainline fleet getting the new technology by 2020. Our Gogo 2Ku service provides a faster connection speed, which will let you stream, browse and chat from gate departure to gate arrival, virtually everywhere we fly. You can choose from one of 500 free titles in our Alaska Beyond™ Entertainment library – the most movies in the sky – or watch your own content from providers like Netflix, Hulu and HBO Go. We know you prefer to bring your own device on board, and our new cabin design also features a tablet holder that can accommodate most mobile devices. This means when you’re on an Alaska flight with satellite Wi-Fi and our retrofitted interior, you’ll be able to watch your favorite movies and TV shows on your own device, from gate to gate – without interruption. That’s flying smarter. Mood lighting isn’t just about creating a cool ambiance. If done well, it can help promote rest or productivity, depending on the time of day. To select the right colors and intensity, we consulted lighting experts. They used light readers to determine the circadian stimulus and the best options for night and day. Everyone has a built-in internal clock that’s wired to respond to natural light. If you’re crossing time zones on a long-haul flight, mood lighting can help you fall asleep on a red eye or stay focused on a work day. Lighting can also have an effect on your emotional state. Research shows that certain colors can trigger different physical and emotional responses. While red is associated with emergencies and shown to increase blood pressure, blue has a calming effect. In general, the human body is most comfortable under colors of light found in nature such as a blue sky or magenta sunsets. On a plane, research shows guests are typically more stressed during boarding, takeoff and landing. 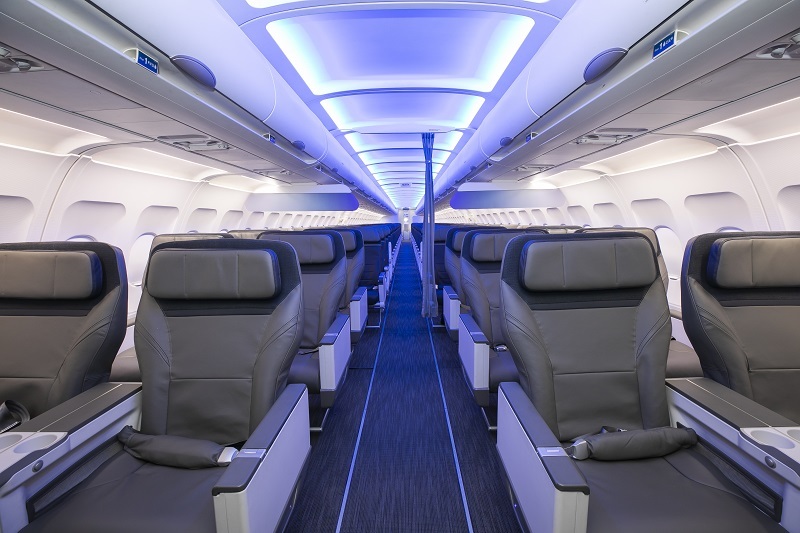 We wanted to make sure our aircraft lighting eased anxiety and enhanced enjoyment for the duration of our flights. In the end, we landed on a range of blues and whites found in nature that complement the daylight coming in through the aircraft windows and, most importantly, make our guests feel good. We created a daytime and nighttime scene to ensure the lighting wouldn’t negatively affect melatonin levels or create unwanted circadian stimulus. 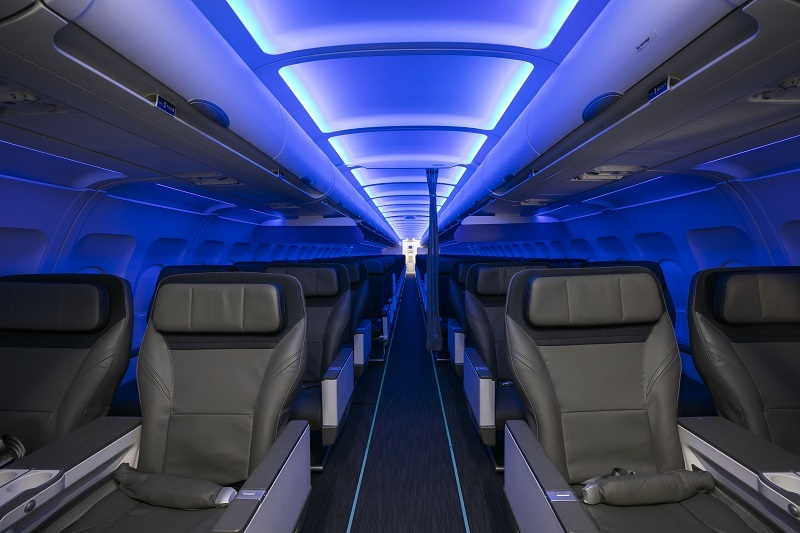 15 comments on "New tech: Fly smarter with satellite Wi-Fi, mood lighting"
Wiil there be new first class seats that recline? Hi Louis. Yes, the seats recline throughout the cabin. Will the Satellite wi-fi work on the Hawaii flights? Equipping our Hawaii flights with satellite Wi-Fi is a top priority! Please let people know that there are no more free movies with this service. It has caused a lot of confusion on the planes, as the flight attendants do not know this as well. OR if there is a way to get to Alaska Beyond, make it clear. Excited for satellite but when will it be installed on Hawaii flights where it’s badly needed? We’re with you, Travis. Hawaii flights are a top priority for getting satellite Wi-Fi. Thank you, this is overdue and can’t happen fast enough. I’m sorry to see GoGo involved as I’ve wasted more money buying their Inflight service (that almost never works) than I want to think about. Hi James, we’re excited for satellite Wi-Fi too! Sorry you haven’t had a better experience in the meantime. How bout Live TV? That would be huge. No plans as of now, but I hear you!